A new community engagement initiative delivered by the University’s Research Division has provided an educational boost for a Tasmanian family of five. The golden Research Trail, held as part of Open Day activities this year, showcased each campus’ exciting research developments encouraging visitors to navigate sites and engage with displays. The trail was a hit with participants who collected stamps at each display to enter the competition to win an iPad Pro. The Yaxley family from the North-West were the winners of the inaugural competition. Parents Ray and Maree are especially grateful as the iPad will support two of their children who experience learning difficulties. Nine-year old Myra and eight-year old Noah both have dyslexia. Now, thanks to the competition, they will be able to use the device to download specific apps that will assist with their education. “There are a couple of different apps that we have to download, and they’re only available through Apple and compatible with an iPad,” Maree said. “One of them is to actually help with the specific learning difference of dyslexia - identifying different sounds and being able to work through them with the user. 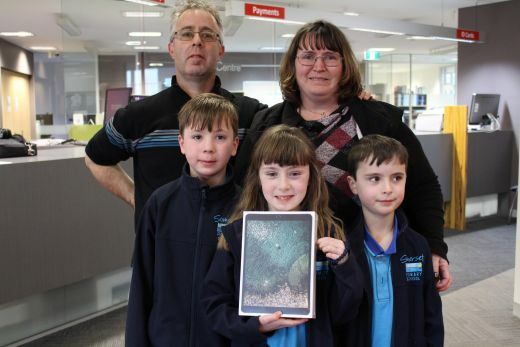 “It was recommended by a healthcare professional for both Myra and Noah, and we were thinking we don’t have eight to nine hundred dollars to buy an iPad at the moment, plus the few hundred dollars it costs to buy the app. Both Maree and husband Ray are graduates of the Cradle Coast campus and have also navigated dyslexia themselves. “We both came to university as adults and graduated with a higher education qualification, so our children have always viewed this campus as a second home,” Maree said. The pair have been taking Myra, Noah, and eldest child Rhylie to the Cradle Coast campus Open Day for a number of years. “We’ve previously brought them for face painting, and now they play with the technology and go up to the medical students and play with the bandaging and different things like that,” Maree said.